This critically acclaimed production is touring for the second year due to overwhelming popular demand. Told with an original voice, it has already captivated audiences to critical acclaim. This bold new play takes the audience on an exhilarating rollercoaster ride as it challenges the notion of the angry and strong Black woman. 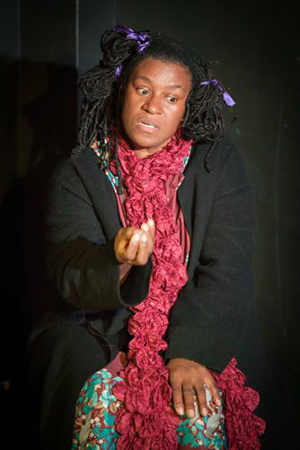 Marcia Layne’s brand new monologue Bag Lady boldly explores important issues of mental health and social exclusion, both challenging and celebrating the notion of the ‘angry’ and ‘strong black woman’. Meet Eve, covered in a huge overcoat, epitomising the homeless ‘bag lady’. The items in the trolley are symbolic, representing her somewhat troubled life story - some inspiring wrath, some pain and some instilling moments of pride. As she peels back the layers, through her rants and reflections we realise that not only is it okay to be angry, but sometimes it is essential for our survival. Amanda Huxtable, Artistic Director of Hidden Gems explains: At Hidden Gems Productions I have the utmost pleasure of being one of the first to read Marcia Layne’s new scripts. Bag Lady has taken me to places I’d forgotten I knew about, made be burst out laughing and gasp almost in the same breath. A play for our times. It is a fierce and funny play. It is the play we've been waiting for. Eve tells it like it is and I’m glad she does because I feel stronger and ironically calmer than before because of it. Every word counts. Bag Lady is suitable for teenagers and adults.